Terms, methods and techniques of the architectural-art-glass trade. • Fusing: melting pieces of glass together to make one piece. • Slumping: laying pieces of glass onto a texture and heating them to create a type of draping effect for embossing. • Casting: melting pieces of glass to a molten stage. 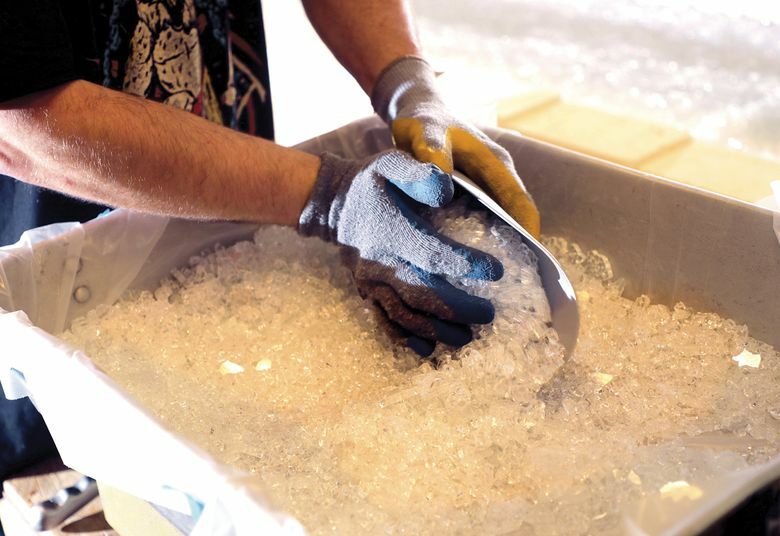 Cold glass: These techniques are used when the glass is processed outside the kilns, and heating is not a factor. • Etching/carving is done by sandblasting; high-pressure air is mixed with an abrasive material to cut away at the top layer of the glass to create a frosted texture. Sand-carving can produce a three-dimensional image. • Glue-chipping creates an organic, almost-snowflake-like texture. Glue is poured over the surface of etched glass; when the glue dries, it pulls tiny shards of glass away with it to create texture. • Leaded glass is interchangeable with stained glass. It is the process of connecting pieces of glass with leaded channels. 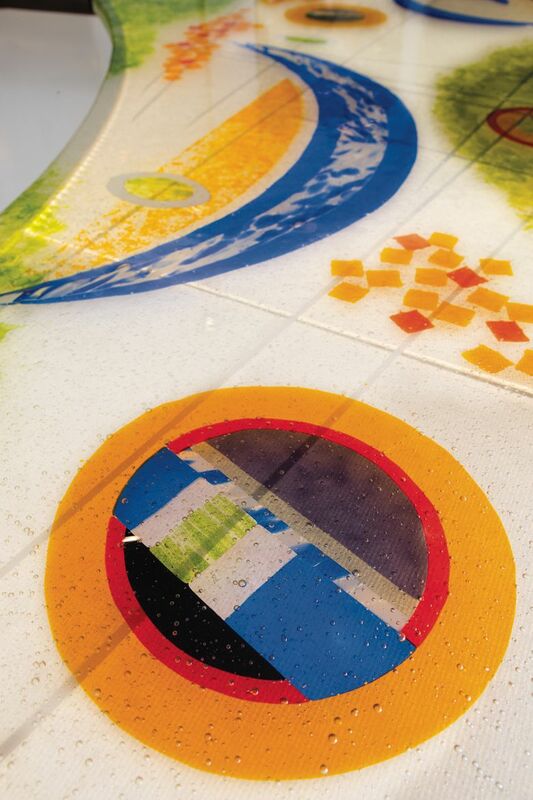 • With lamination, two or more pieces of glass are held together with a vinyl or resin interlayer. If the glass breaks, this plastic component keeps the piece intact. • With tempering, annealed (slowly cooled) glass is exposed to high temperatures and then to very cold temperatures, making the glass stronger. If tempered glass breaks, it shatters into tiny pieces with no sharp edges. “It’s like the windows of a car, and is used in vulnerable spaces,” says Glassworks designer Steve Shahbaghlian. • Dichroic glass is a chemical surface treatment that bonds to the glass at a molecular level and results in glass with three color qualities; the glass becomes iridescent. This is usually used as a component of warm glass. • Inclusions are objects that are incorporated into the glass structure — intentionally, like color, metal or bubbles that form in the kiln, or unintentionally (and unhappily! ), such as microscopic foreign substances that compromise the integrity of the glass. • Low-iron: plate glass without the greenish hue.